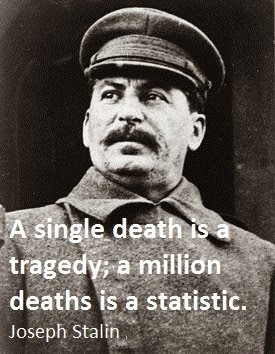 Joseph Stalin was the leader of Soviet Union from mid-1920s until his death in 1953. Here I have compiled some of his famous quotes, hope you will learn from them. Gratitude is an illness suffered by dogs. History has shown there are no invincible armies. I believe in only one thing,the power of human will. Ideas are far more powerful than guns. We don't let our people have guns. Why should we let them have ideas? It is not heroes that make history, but history that makes heroes. There are on occasions, as we know, when resources are abundant, but they are expended so incompetently that the advantage is nullified. This creature softened my heart of stone. She died and with her died my last warm feelings for humanity. We think that a powerful and vigorous movement is impossible without differences — "true conformity" is possible only in the cemetery. When there's a person, there's a problem. When there's no person, there's no problem.